Hey guys, I think I’m stuck here and I really need some help. In my opinion it works just fine. The code removes all elements from the initial array that are of the same as the given arguments. I hope someone knows an answer how I am able to pass the Challenge or how to get my Code to work. 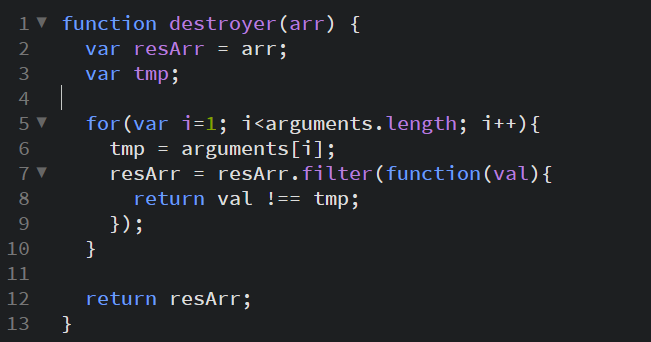 In your code, I stored the destroyer function’s arguments in a variable, then used that in the inner function instead. I think I’ve read somewhere that referencing arguments via its function’s name is not a good idea.